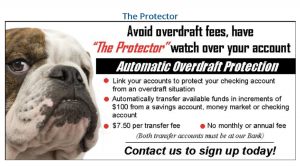 Avoid overdraft fees, have “The Protector” watch over your account. Link your accounts to protect your checking account from an overdraft situation. Automatically transfer available funds in increments of $100 from a savings account, money market or checking account.